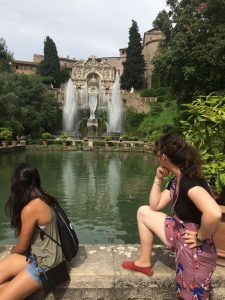 This is the first in a series of blog posts from Whitties studying on Whitman’s Crossroads: Rome, Italy: Landscape and Cityscape in Ancient Rome program this summer with Professor Kate Shea. Melia Matthews ’20 is a Biology & Classical Studies Major. 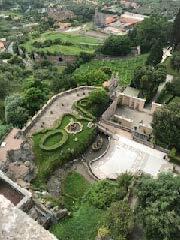 frescoes, the different styles of paintings, and the gorgeous views overlooking the valley below. powered fountains, and flowing water everywhere made the outdoor space a heaven on earth. and its estate. Along with the water features, there was also lots of shade, a nice change from the wide open spaces of the Roman forums and the hills of the city. cuisine next to an ancient temple, and saw the place that was home to the most powerful families in the region for hundreds of years. 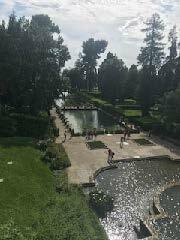 And yet, sitting by a fountain, surrounded by friends and fellow classical aficionados, finding time to relax and appreciate all that we had seen, was still my favorite part of the day. This entry was posted in Uncategorized on June 18, 2018 by serranvj.